If blood vessels in the direction of the bone are closed off, an infarction is inevitable. Living tissue dies off and patients suffer from severe pain. But help is at hand: orthopedic surgeons base their therapy on the degree of injury – the scalpel can be left in the cabinet. One of the most prominent patients has lived more than 3,300 years: Tutankhamun, the legendary Egyptian pharaoh, according to the latest diagnosis, had an aseptic osteonecrosis of the second and third metatarsal bone and was probably quite unroyally restricted in his movements. Osteonecrosis is not a problem of the foot alone: In theory, it can strike any bone. Studies show that especially often the joints – knees, shoulders and hips – are affected. For the thigh, publications from the USA indicate 10,000 to 20,000 cases per year. 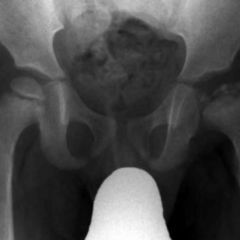 It usually begins with severe pain – an accident, bone tumors or septic necrosis can be quickly excluded by differential diagnosis. X-ray and MRI scans bring clarity to the picture, indicating characteristic symptoms of decay of the bone. Fast intervention is then needed, on the one hand in order to prevent further damage and, on the other hand, especially with older patients, in order to deal with the risk of immobilisation and all its recognised consequences. Most of the time however, patients are aged between 30 and 50 years, yet even pediatricians know this topic. The exact mechanisms of the disease, despite numerous research approaches, are still obscure. This much, however, is certain: Risk factors include chemotherapy, radiation exposure, alcohol and various circulatory diseases. And professional groups such as divers and bridge-construction workers, who are exposed to long periods of high pressure, seem to suffer it very often. In addition, it affects more often than on average those with sickle cell anemia or lupus erythematosus. 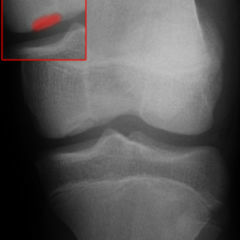 Drugs can likewise also cause aseptic bone necrosis. In relation to bisphosphonates there now exists, in contrast to steroids, a pretty solid data base. Such were the findings by Australian researchers of significantly more bone necrosis, especially in the jaw, associated with the use of alendronate, etidronate and risedronate. The human monoclonal antibody denosumab showed similar adverse effects. As a basis of explanation for this, the researchers suspect a disorder of bone rebuilding and the blood supply. The disaster which was revealed: bisphosphonates have been prescribed more and more over years, not only for the treatment of osteoporosis, but also in oncology patients who suffer from bone metastases. Thus, the instances of osteonecrosis of the jaw are accumulating. In order to capture this systematically, already by 2004 the Elsbeth Bonhoff Register was established. Now there are have been slightly more than 1,000 records submitted. For osteoporosis patients taking bisphosphonates, the risk is given as one in 13,500, for cancer patients, however, the risk is between one in 100 and one in 50. 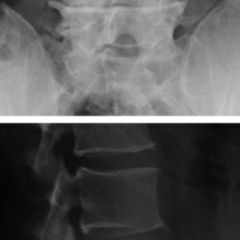 But what exactly happens with osteonecrosis? At the cellular level, the interruption of blood supply to the bone leads to the death of functional structures. Scientists have found out that blood stem-cells are particularly sensitive – after twelve hours without adequate oxygen supply, they ‘give up the ghost’. Osteocytes, osteoblasts and osteoclasts survive a maximum of 48 hours, and reticular cells are gone after five days. Yet the reversing of this pathway is also conceivable, for example, following one successful therapy: If bone is again adequately supplied, the formation of fine capillaries can occur. Undifferentiated mesenchymal stem-cells migrate from adjacent, intact bone tissue into the dead material. Due to their high proliferation and differentiation capacity, they replace dead structures, new osteoblasts or fibroblasts originate. Macrophages also come into play – they remove the dead cells. In the end, on the inorganic hydroxyapatite bone scaffold, living bone is restored. Researchers are now employing these regeneration processes specifically for therapy. This has enabled French surgeons to replace necrotic bone with material from the iliac crest. Particularly successful were so-called vascularized grafts, in which the blood supply was reestablished using microsurgery in its new location. A study has evaluated the method with 60 patients with an average follow-up period of 18 years – the results were, for around 52 percent of patients, more than satisfactory. 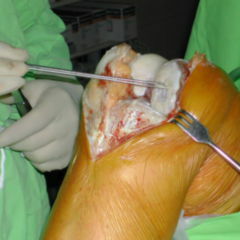 And researchers from the USA studied using a double-blind study cell transplantation in osteonecrosis of the hip joint. Patients in the control group only received a decompression in the form of Pride drilling. All others received mononuclear cells from bone marrow – and after 24 months had significantly less pain than the comparison group. Also, deterioration of the lesions was considerably rarer. Adverse effects, by contrast, were barely significant. But it isn’t always the case that the scalpel needs to be pulled out. With children or young patients with less pronounced lesions, immobilisation alone with the use of a cast over eight to twelve weeks is already of quite some help. For very large defects or those close to a joint, surgical intervention is nevertheless still necessary. Pride drilling relieves the bone in these instances, otherwise only endoprostheses are usually of help. If the surfaces of rod-ends in particular have died off, alloarthoplastics come into the picture. In this case, surgeons replace the joint surfaces, as a whole or in part, with metal or plastic implants. From an orthopaedic perspective, British surgeons specifically using so-called metal-metal bearing couples (metal-on-metal resurfacing) have had good outcomes. However, recent studies report problems: chromium and cobalt ions from the alloys used made their way partly into the body and so can possibly promote tumor growth. This is reason enough for the British Drug Administration to have about 40,000 patients with the relevant implants examined. Especially with osteonecrosis of the jaw, teriparitide could help (it being a genetically-engineered fragment (of parathyroid hormone) from the parathyroid glands). In the U.S. and in Germany, this protein has already been implanted in female patients with osteoporosis. Scientists now report of a 88-year-old woman who had developed, due to many years of alendronate treatment after a dental procedure, necrosis of the mandible. After eight weeks of teriparatide, there was complete healing. The classic removal of dead regions, including doses of antibiotics, brought no effect. But it can be even easier – especially in the early stages, many patients benefit from hyperbaric oxygen therapy. In a hyperbaric chamber, they receive pure oxygen for one hour at 2.5 bar. At least fifteen sessions are required. Particularly in cases of necrosis of the knee, data from quite a number of patients has been presented: 66 percent were completely free of symptoms after the end of the treatment and 44 percent had, with MRI control, an almost complete resolution of necrosis. This is, according to the authors, due to the approximately 20-fold increase in the amount of oxygen which, under appropriate conditions, manifests in the blood. In the capillaries regions, the diffusion of the gas therefore increases significantly. There is only one problem: Neither the mobile nor the stationary hospital hyperbaric oxygen therapy has had the costs absorbed by medical insurance funds in Germany.